Nature Zone Pet Products cricket total bites soft moist food is the complete gut load, nutritious food and water in a soft gel cube. It is a complete diet for all feeder insects. Easily assimilated ingredients by all herbs. 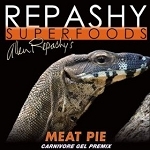 Provides a total gut load of more than 15 vitamins, minerals and nutrients. It's green because it's loaded with Spirulina and other nutriceuticals. 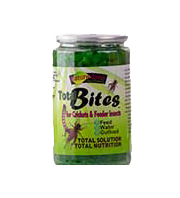 Cricket total bites provides total nutrition. Comes in 24-ounce bottle.